Every winter the number of southern gastric-brooding frogs in Australia would mysteriously diminish, their loud staccato calls gone missing from the forests in Queensland. Biologists — already fascinated by the females’ practice of swallowing fertilized eggs and giving birth orally after a period of gestation — hypothesized that the population of this unique species weas hibernating in deep rock crevices until they reemerged with the summer rains. But before the frog could be studied further, the species went extinct in the wild in 1981. The last Rheobatrachus silus died in captivity in 1983. 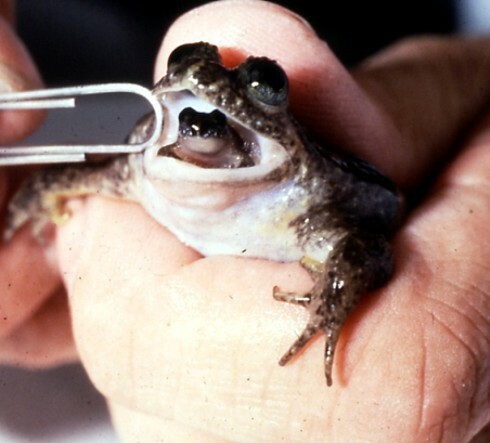 For three decades, samples of the extinct frogs sat in a freezer. But this year, scientists in Australia announced that they have made an extraordinary first step towards bringing the frog back to life. Using the cloning technique called somatic cell nuclear transfer, a team at the University of New South Wales took fresh eggs from another amphibian species and replaced the eggs’ nuclei with that of the extinct species. In March, some of these eggs began to spontaneously divide over the course of several days, reaching the early embryonic stage. Around the world, de-extinction initiatives such as this one are racing to resurrect genomes and living specimens of recently extinct and even long-dead species. In Spain, scientists continue trying to bring back the Pyrenean ibex, a species extinct since 2000 that was briefly resurrected in 2009. (The baby ibex, born to a domestic goat, lived for a few minutes before dying.) In South Korea, the Sooam Biotech Research Foundation is working with Russian scientists and the Beijing Genomics Institute to attempt to clone a woolly mammoth. Scientists at the University of California, Santa Cruz are sequencing the genome of the passenger pigeon — last living on earth in 1914. The Caribbean monk seal, Carolina parakeet and Tasmanian tiger have all been suggested for resurrection by the Revive and Restore Foundation, a new non-profit whose purpose is to bring extinct species back to life. De-extinction is an even more thrilling and awesome a prospect than cloning pets or farm animals, of which Dolly the Sheep is most famous. There is a reason the movie Jurassic Park still has a grip on our cultural imaginations. For scientists, the technological feats in successful de-extinctions are more complex and challenging than cloning living animals. But these efforts also recall ancient narratives like that of Noah’s Ark and the miracle of resurrection. And then there is the hope implicit in the possibility of de-extinction that it will help humanity avert the environmental apocalypse that extreme biodiversity loss threatens. De-extinction pioneers are eager to invest their efforts with a deeper moral purpose, one that suggests the power to bring back species could mitigate humanity’s liability in the ongoing Sixth Great Extinction, and even work to correct past crimes against the planet. “Humans have made a huge hole in nature, we have the ability, maybe the moral obligation, to repair that damage,” said environmentalist Stuart Brand, former editor of the 1960s back-to-the-land guide Whole Earth Catalog, and co-founder of the Revive and Restore Foundation. To date, de-extinction has received a lot of breathless publicity but very little critical debate. The question that remains unanswered is whether it could become a useful conservation tool for the thousands of species that are endangered and facing extinction today. In fact, it is possible that these advances could have the opposite effect, putting endangered species at greater risk. In May, a dozen scientists, ethicists and conservationists gathered at Stanford University to discuss the potential legal, political and ethical ramifications of de-extinction. A concern echoed among a number of participants was that the current extinction crisis could be viewed by policymakers and the public as less calamitous if we have (or will soon have) the ability to resurrect extinct species. The fear is this could lead to a slowdown in protecting species in the wild, and simply putting genetic material on ice for resurrection at a later date might become standard practice. The fact is that de-extinction, said Ronald Sandler, a professor of philosophy at Northwestern University who spoke at the conference, does not necessarily preserve the value of the species as a whole and its relationship to its habitat. And it does not prevent extinction or give incentives to reform behaviors that lead to extinction, which in so many cases is the destruction of habitat by humans. In the case of the southern gastric-brooding frog, it is unclear whether the forest streams it once inhabited could support resurrected frog populations again. The region, which is home to half of Australia’s amphibian species, only recently emerged from the longest drought in recorded history. Even some of the ancillary benefits of de-extinction research — expanding databases of genetic material for genomic or medical research, for instance — can seem dubious when contemplating the prospect of a future world in which habitats themselves are extinct even if the animals who once lived in them aren’t. M.R. O’Connor is a journalist and freelance foreign correspondent. She blogs about science, ethics, travel and literature at www.unnaturalselection.info and is currently writing a book about the future of conservation biology for Palgrave Macmillan.